Although there are a ton of bbq sauces available, I had been wanting to try making my own for a while and now was the perfect time as I had something in mind. As it turns out, making your own bbq is pretty easy and you probably have all of the ingredients that you need. 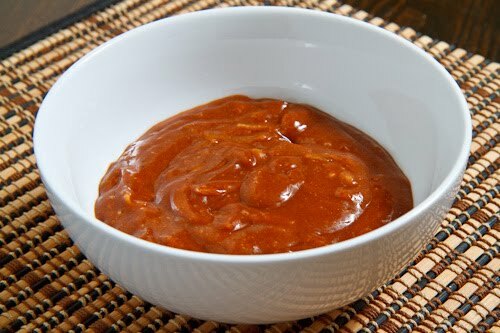 Bbq sauce generally starts with a tomato base such as ketchup and adds something for sweetness, vinegar for a tanginess and some kind of heat. You can play around with the basic ingredients and you can add other ingredients to come up with whatever flavours you want. I stuck with a pretty simple bbq sauce for my first attempt and it turned out pretty good! It was a nice blend of tangy, sweet and spicy and it as full of flavour. I enjoyed the texture that the grated onion added and the smokiness that the chipotle chili powder and smoked paprika was really nice. Stay tuned to see what I use it in. I just had a class this week on rubs and sauces with world champion competitive BBQr Mike Davis and learned quite a bit. I like that you used smoked paprika, good idea. I used to swear I'd never give up my tomato use in barbecue, but now I substitute adobo paste – ancho – or pure ground dried peppers – Big Jims or red Anaheims or mixed Mexican meaty peppers such as anchos and negros and pasillas, etc. Hungarian paprikas are similar. Much more than just a few tablespoons. My big three ingredients are that, the mustard, and the vinegar. The onion is a minor though absolutely delicious ingredient. I just found this site and love it. Okay Kevin, found the bbq sauce and it looks awesome. Silly me to think you didn't have one. LOL. Could you list it in your awesome sauces index. Gotta go add a couple of things to the one I am making right now. Thanks Kevin. Think it would be really detrimental if I used yellow mustard instead of dijon? Michelle Miesse: Yellow mustard should work as well! Divine! How long would this keep in the fridge? Anonymous: This will keep in the fridge for a few weeks!